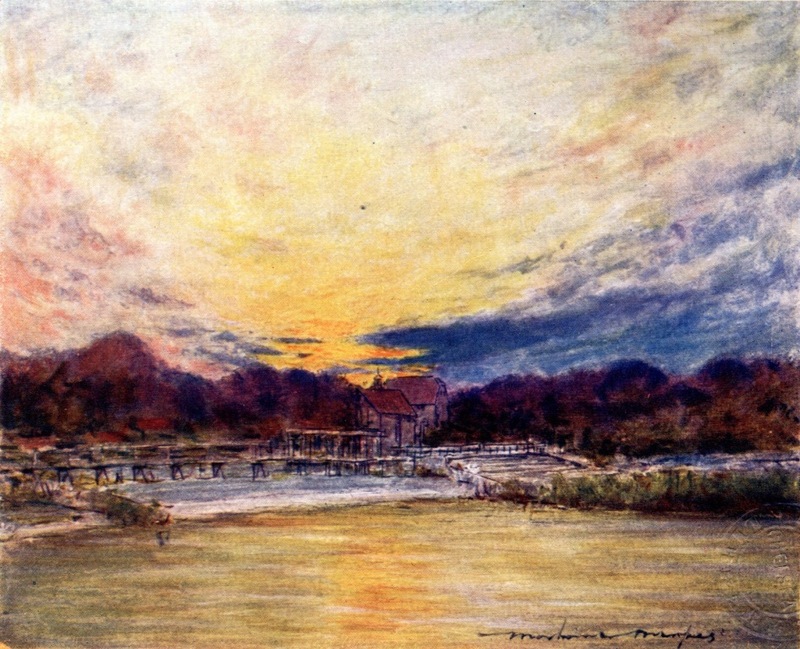 There are several parallels between the work of Mortimer Menpes and Yoshio Markino. Markino brought a Japanese sensibility to the way he looked at London and Londoners, and an outsider’s eye for the unfamiliar sights of his new home. He was particularly fascinated by the river. 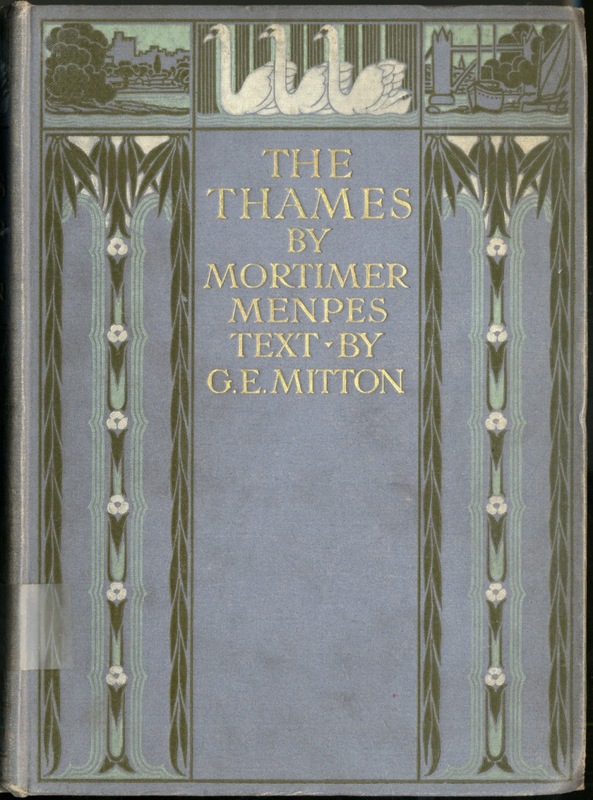 This fascination was shared by Menpes who published this book, The Thames in 1906 in collaboration with G E Mitton. 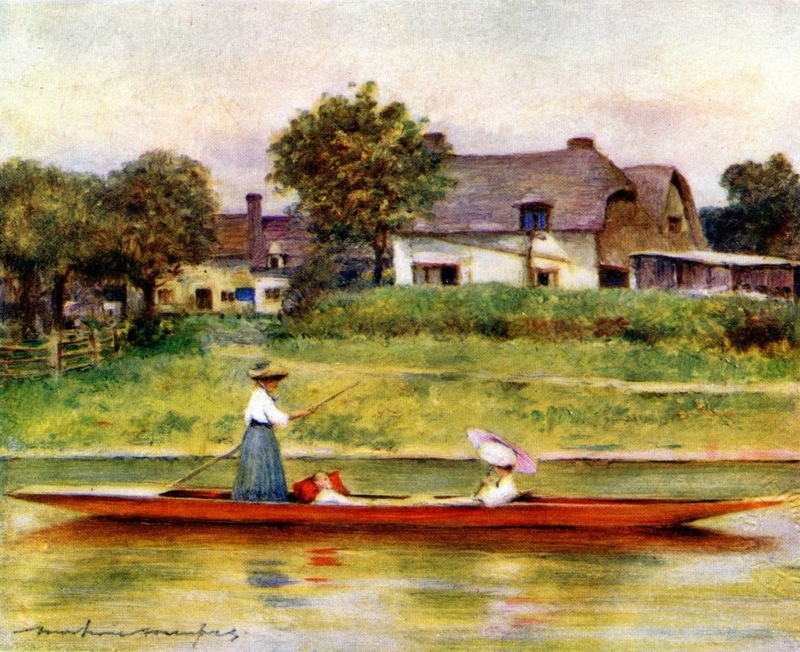 Menpes also brought an outsider’s viewpoint to the river. Remember, he was from Australia and had been brought up in quite a different climate and landscape. 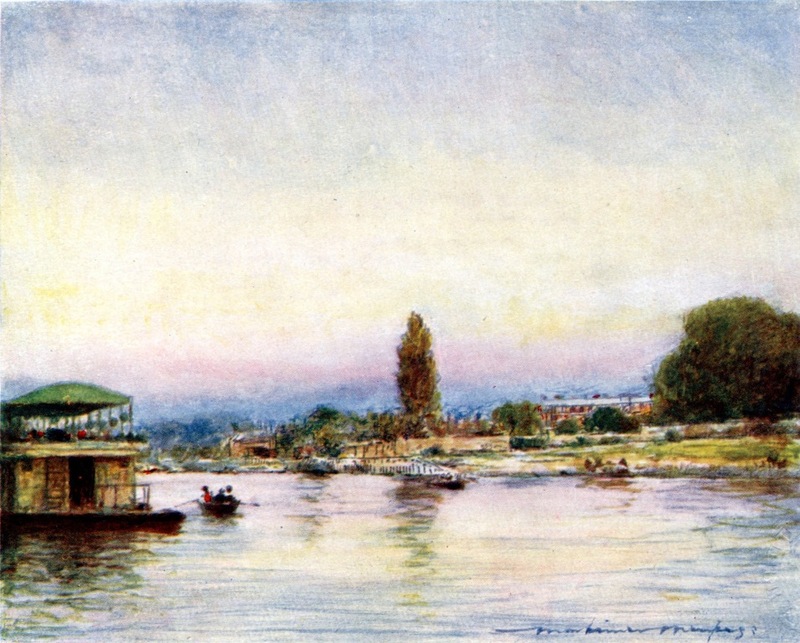 So it’s not surprising that while Markino concentrated on London’s river, the tidal Thames with its bridges, embankments and fast flowing water, Menpes was captivated by the other Thames above the tide. 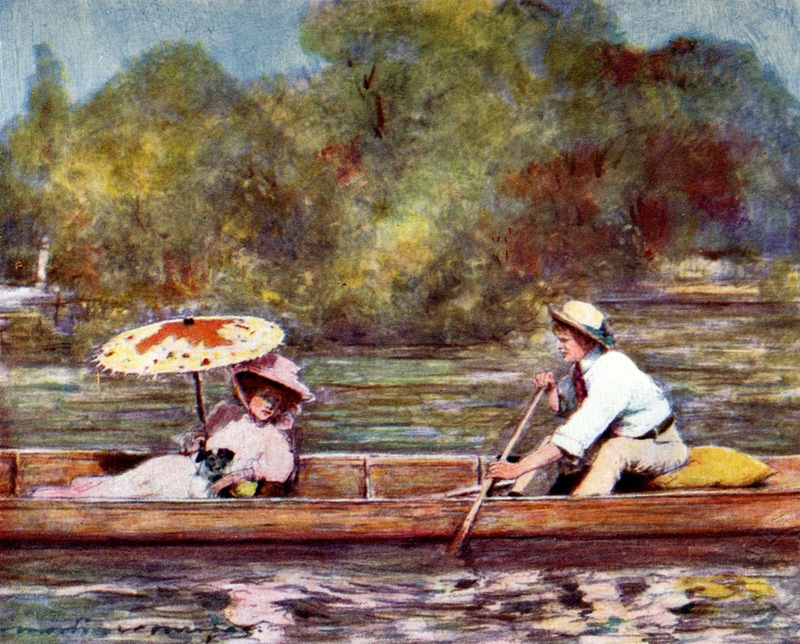 This was still a world of country towns, lazy river pursuits and long still sunny days -that late Victorian / Edwardian summer epitomised by Jerome K Jerome’s Three men in a boat or Kenneth Grahame’s the Wind in the Willows. 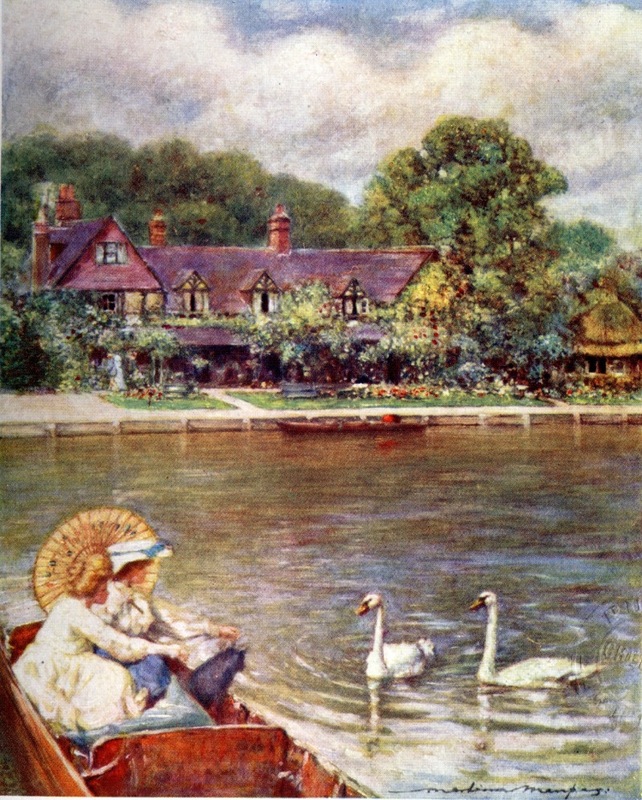 The other thing Menpes shares with Markino is an eye for the picturesque qualities of the new women of the Edwardian era. 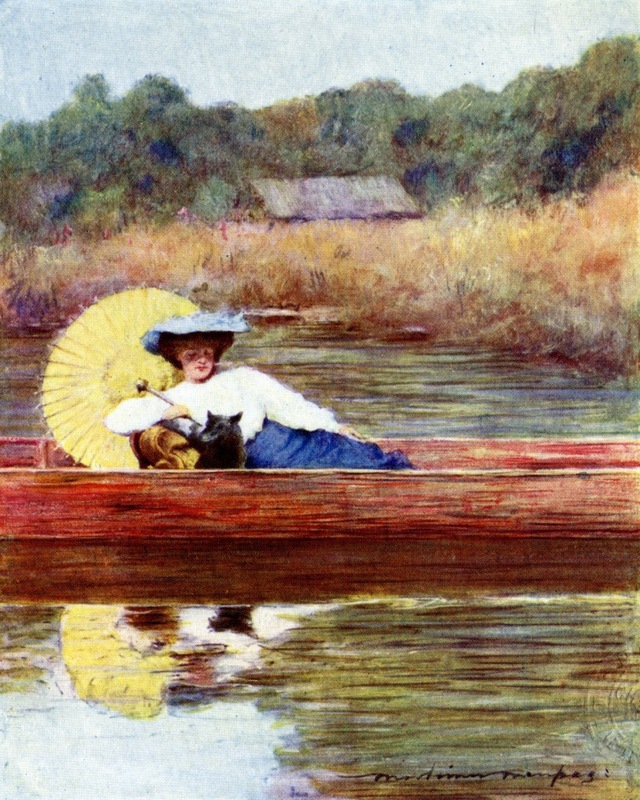 Sometimes they lounge casually under a parasol with the obligatory small dog who, like his literary ancestor Montmorency is an essential part of the crew for a river journey in a small rowing boat. Sometimes they took the oar themselves. In this case it looks like the same woman, slightly sad about having to dump her companion but happy to be making some progress at last. 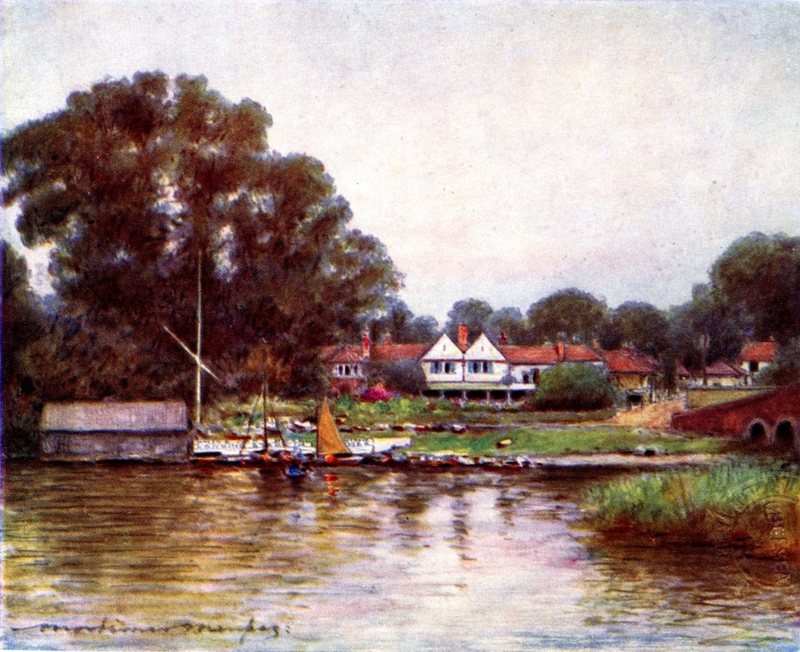 The upper Thames had declined as a route for commercial traffic but had seen an enormous growth in boating for pleasure. There were tranquil backwaters suitable for punting. Deserted stretches, given over to wild life. “Hear the lark and harken to the barking of the dog fox gone to ground. 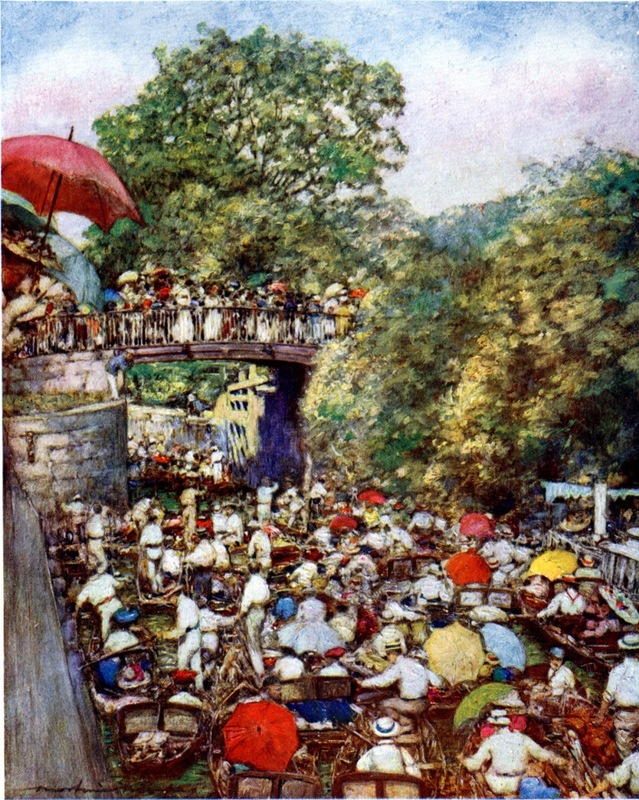 But the river was also a site of mass entertainment. 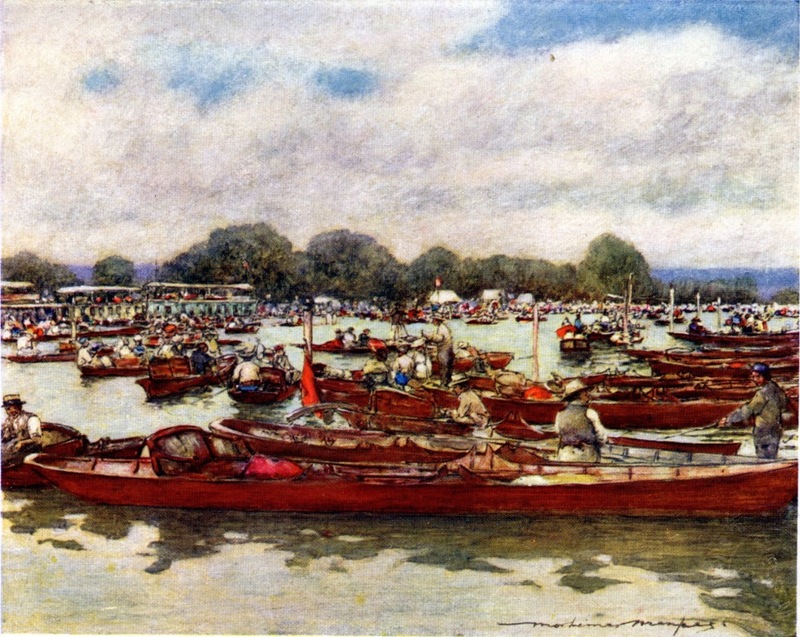 Large gatherings of pleasure seekers attended events like Henley Regatta as they still do today. These events were attended in huge numbers by the new middle classes who had leisure time to fill and the ability to travel to formerly exclusive spots by train and river boat. A traffic jam of river craft in the narrow waterway. Below, the area near the lock where larger boats and steam launches wait their turn. You can even see one of the luxurious houseboats (gin palaces as one of Jerome’s characters called them) although I doubt if could go through the lock. 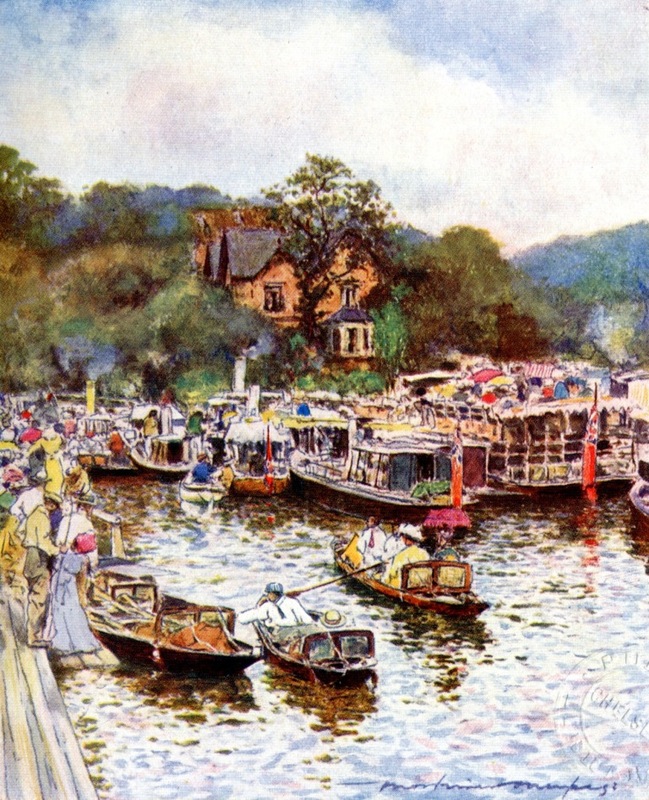 By the end of the day the crowds of fashionable pleasure seekers had withdrawn to their houseboats and inns or just made the journey home and the river was calm again. All the different kinds of river craft had made their way to a mooring. 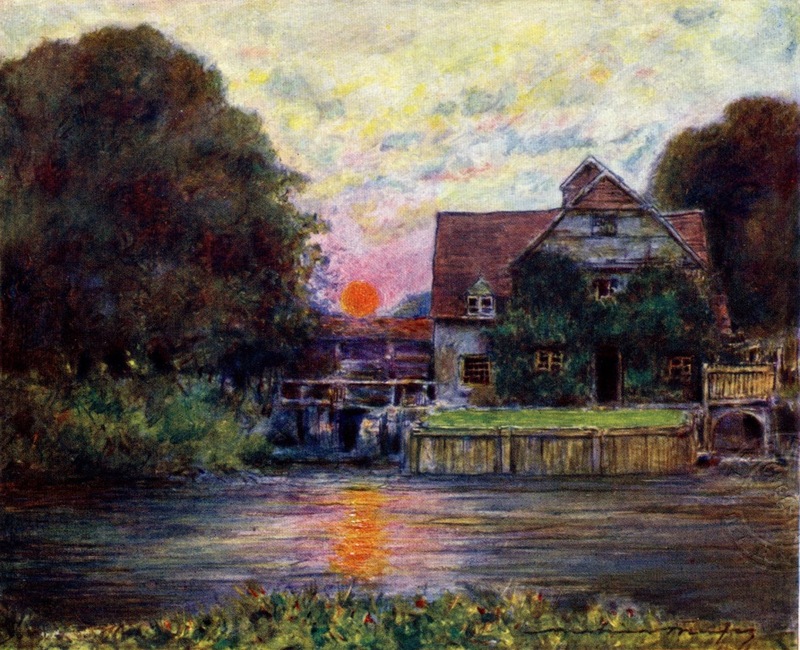 The very fortunate had a pleasant riverside dwelling to return to as the sun went down. The sun hangs low in the sky and the river people are indoors telling stories about their exploits on the water. 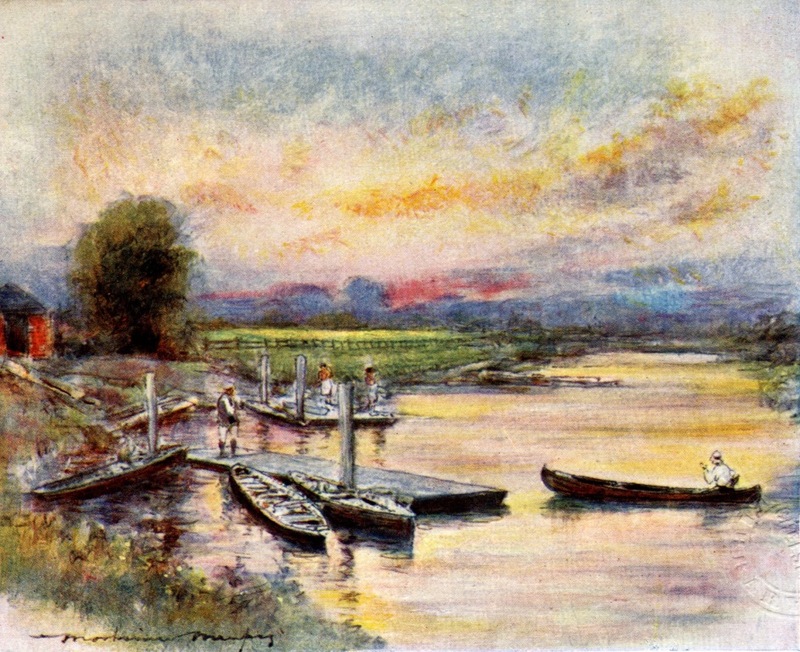 The picture below is my favourite of Menpes’s illustrations of his river journey. A woman finds a comfortable spot and nods off on a quite summer afternoon. Her parasol slips back, but her face is still shaded by her wide brimmed hat. Her unseen companion sits quietly at the stern so as not to disturb her. Even the dog sits calmly enjoying the same relaxed moment as his human companions. The peaceful moment lives on forever. Lyrics by Roger Waters and Syd Barrett (Pink Floyd), Roger McGuinn (The Byrds) and Bob Dylan. Everybody knows Jerome K Jerome’s Three men in a boat but for a modern day version of a river journey try one of my favourite books, Nigel Williams’ Two and a half men in a boat. We’ll come down to the river again one day I’m sure. Finally, thanks to Kat for all her work in Local Studies, and for her friendship. 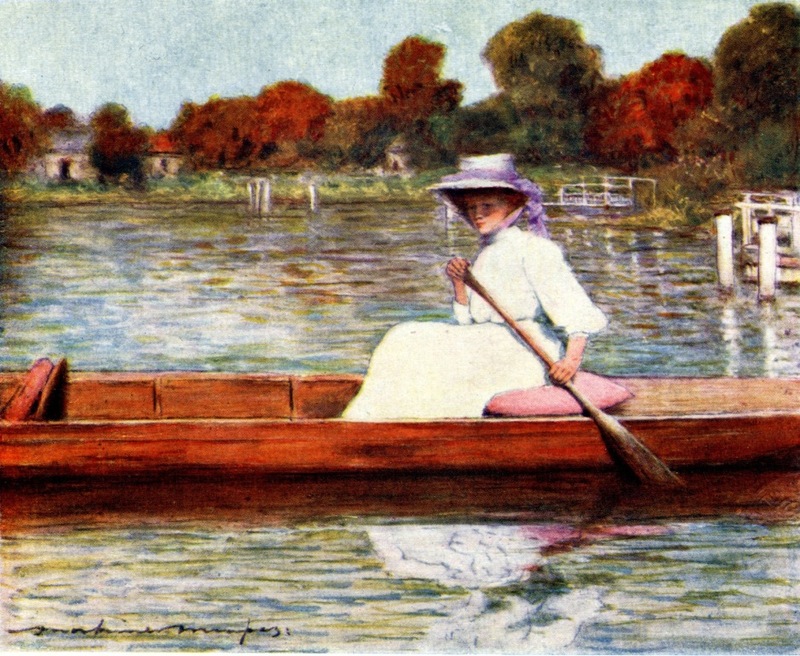 This entry was posted on Thursday, November 28th, 2013 at 12:11 am	and tagged with Australia, Book illustration, Chelsea, Henley Regatta, Mortimer Menpes, River Thames, Riverside and posted in 20th Century, Chelsea, Painting. You can follow any responses to this entry through the RSS 2.0 feed. 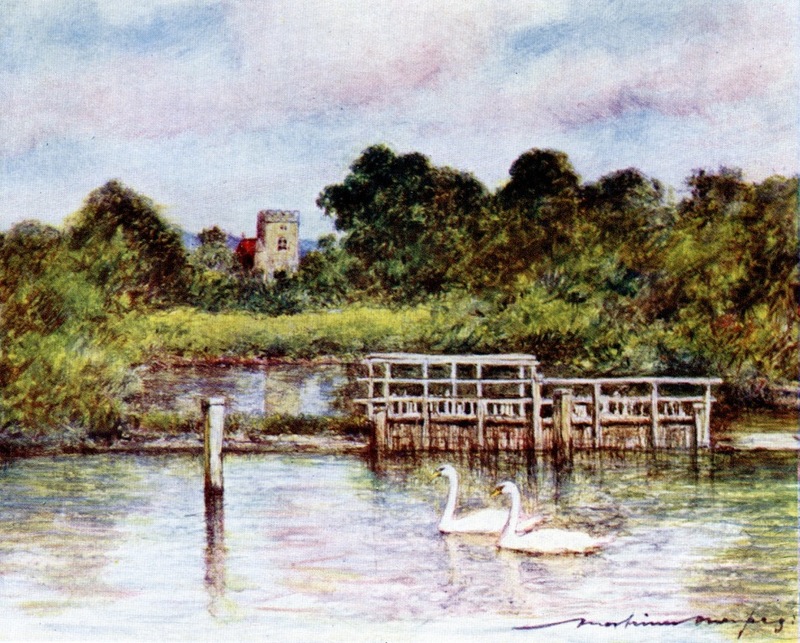 The 4th painting was viewed from the left hand side, looking north, on the old Caversham bridge (present one built 1926). The structures in the water are eel traps, called eel bucks. The little lane leading down to them is still there called Buckside (Google Earth it). The bucks are long gone but the church in the background is St Peters & of course still there. You can stand on the same spot today via Google Earth, but the church is hidden by trees. Looking down Buckside from main road, the wood framed cottage on the left is the original fisherman’s home.